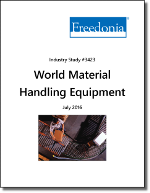 Global demand for material handling equipment is forecast to rise 5.3 percent per annum through 2020 to $176.0 billion. Advances at the global level will be largely driven by market growth in China and other industrializing nations, which will account for nearly two-thirds of all new material handling machinery demand generated between 2015 and 2020. Multiple trends will fuel market growth in developing parts of the world. Fixed investment spending, industrial output, power generation, and mining activity are expected to rise in these countries due to healthy economic growth and increasing consumer spending. Manufacturing and other industries will continue to attract large amounts of foreign capital, and national governments will build new airports, seaports, rail networks, and power plants and upgrade existing ones. The logistics and transportation industries of these nations will continue to expand at a healthy pace because of the expected economic growth and increasing international trade. Material handling equipment gains will be driven as well by an ongoing shift toward use of more expensive and advanced machinery at the expense of conventional models. Companies mentioned include Toyota Industries, KION, Mitsubishi Heavy Industries, Cargotec, Shanghai Zhenhua Heavy Industries, Crown Equipment, and Hyster-Yale Materials Handling.